Facilities Protection Force Training Spc. Emily Donaghy, 350th MPAD, 3rd Brigade Public Affairs, 82nd Airborne Division -- A class of twenty-five Iraqis completed the Facilities Protection Force (FPS) program Oct. 11 at Forward Operating Base Mercury. FOB St. 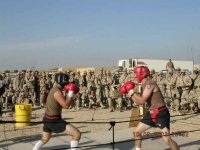 Mere was renamed Camp Fallujah when the US Marine Corps cast off the Army's monikers for their new homes as part of a wider USMC effort to put an Iraqi face on the Corps' mission. An order issued March 25, 2004, by I MEF's commanding general, directed that all base names be changed immediately. As a result, and to connect with the local communities, the new camps' names were associated with the local urban or geographical areas that they are near. 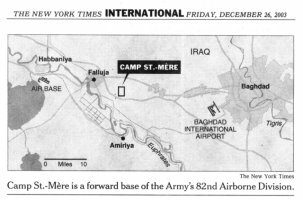 The order came on the heels of I MEF officially taking over the Al Anbar province from the Army's 82nd Airborne Division on March 24, 2004. In addition, the order stated that in "the spirit of the Marine Corps, these bases will no longer be referred to as FOBs. They will be designated as camps". 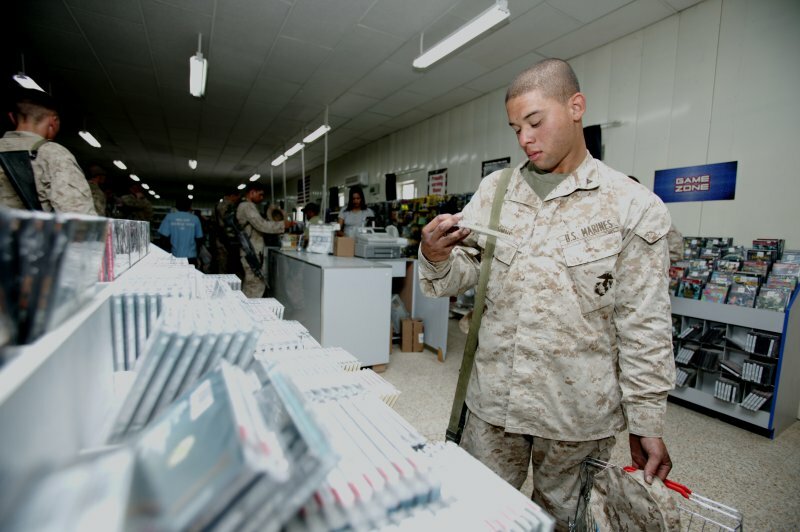 As of mid-July 2004, the Camp Fallujah Post Exchange(PX), one of four main exchanges run by the Marine Corps in Iraq, served residents of the camp, home to the I Marine Expeditionary Force command element and Regimental Combat Team 1's headquarters, along with infantry battalions from nearby Camp Baharia and Camp Abu Ghraib. It offered everything from compact discs to shaving cream. In the first week of November, with four days to prepare, 1st Cavalry Division moved over 2,500 soldiers and over 650 vehicles to Camp Fallujah, in order to support the 1st Marine Division. For this operation 1-5 CAV, 15th FSB and A/3-82 FA went with the Brigade while 2-12 CAV, 91st Engineers, D/9 CAV, part of 15th FSB and the rest of 3-82 stayed behind in Baghdad to conduct critical security missions in their old areas. After arriving in Fallujah the Brigade picked up 1-5 Infantry (Stryker) from Ft. Lewis, the 2nd Marine Reconnaissance Battalion from the 1st Marine Division, and the 759th Military Police Bn as valuable additions to the Black Jack Bde. Upon arrival at Camp Fallujah the Brigade immediately set up its command post, and the units began to replace Marine units around the city so they could prepare for the upcoming fight. On the 6th of November the units of the Black Jack Brigade set an outer cordon, sealing the city against civilian movement and setting the conditions for the following Marine operation, Operation Al Fajr (Dawn). Nothing was allowed in or out of this cordon. This prevented the enemy from escaping the Marine onslaught in the city or bringing in supplies and reinforcements. By mid-September 2003 Charlie Company assembled and moved out to several forward operating bases throughout the areas to the south and west of Baghdad supporting the 3rd BDE Combat Team. Operation Longstreet lasted for 2 weeks and consisted of numerous raids, tactical checkpoints, and a constant presence by All American soldiers from 3rd BDE in the areas south of Baghdad. All of these operations took place as a direct result of Charlie Company soldiers' efforts in gathering much needed intelligence to determine where and what the enemy forces were doing. We were the first unit to commit troops into this area and they remained there throughout the entire two weeks leading to numerous successful combat operations. As Operation Longstreet concluded, the advanced party of the company spent three days securing their new BDE Forward Operating Base named St. Mere. During this time, the soldiers worked long hours gathering information from the 3rd ACR prior to their departure. The days were also spent cleaning out our newly acquired homes. This effort involved lots of sweeping , mopping, bug-proofing, and setting up of the operations center. As the convoy arrived they were given a quick orientation to the Fallujah area. Within three weeks, the BDE pushed out 4 infantry battalions consisting of 1-505 PIR, 3-505 PIR, 1-504 PIR, and 1-32 IN (from the the 10th Mountain Division). Each established their own forward operating bases in the area of operations -- FOB ST Mere (3rd BDE) to FOB Volturno (1-505), FOB ST. Michael (3-505), FOB Mercury (1-504), and FOB Chosin (1-32). The company had soldiers supporting each of these infantry battalions as they seek out enemy forces and begin to stabilize the areas to the west and south of Baghdad. Each Forward Operating Base (FOB) is being provided electrical power, air conditioning, showers, gyms, chow halls, internet cafes, phones, and a PX. The company area is also coming along nicely. To date, they now have several refrigerators, freezers, fans, air conditioners, a weight set, and are in the process of setting up a dayroom. Troops have made an area in our courtyard (nicknamed "Pebble Beach") where once a week they show a movie for the soldiers. The BDE is also created a MWR site for platoons to rotate to at least once in the 6 months they are here. It is a place for the soldiers to rest for a 3-4 day period and take their mind off the serious parts of the job here. This location will have a weight room, pool table, cable television, a pool, and several other types of activities to allow them to relax. TF Panther, at Forward Operating Base St. Mere, near Fallujah, was operating in one of the most volatile areas in Iraq. The area encompassed the Western and Southern part of the "Sunni Triangle" extending west and south of Baghdad. The area remained active with enemy contact. TF 1-319 operated out of FOB St Mere. They were split in three directions responsible for FOB force protection, civil military operation command and control and of course fire support for TF Panther. A Battery was working under 1-504's control and C Battery under 1-32's control. 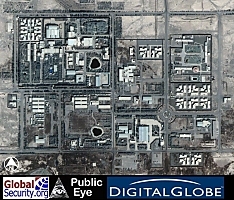 82d FSB continued to operate out of FOB St Mere and (Baghdad International Airport (BIAP). The logistical support and infrastructure improvements they have made were remarkable. From food to water to maintenance of our equipment, they were busy every day. They were the support mechanism behind the scenes that rarely got the right recognition or credit. C/3-4 Air Defense Artillery was working under the control of 1-319 at FOB St Mere. They were in charge of the day-to-day command and control of the force protection of FOB St Mere. The security and quick response capability of force protection improved since they have taken over this task. In mid-September 2003 3/82d MP Platoon rejoined TF Pantherand has been fully integrated. They are working under 1-319 Field Artillery Battalion control. 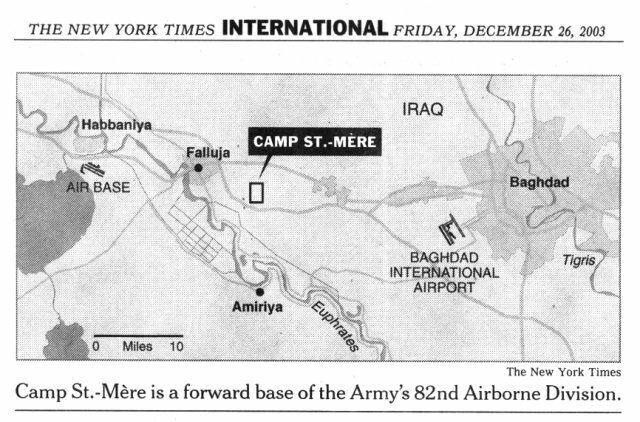 They are based out of FOB St Mere Eglise located near Fallujah. 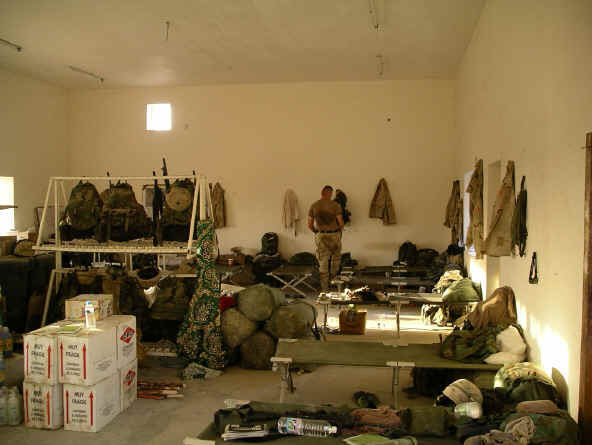 The troopers in the MP platoon are living in buildings sharing 4-6 person rooms. They have access to computers/e-mail, showers, laundry, and hot meals. As the 1st Force Service Support Group settled into Iraq in late March 2004, its combat engineers wasted no time fortifying the base from regular mortar attacks. Arriving in Iraq March 14, 2004, a company from the 7th Engineer Support Battalion quickly noticed several safety concerns and no time taking steps to fix the problems that they found. 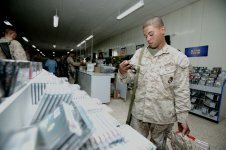 As the I Marine Expeditionary Force slowly began taking the reigns from the Army's 82nd Airborne Division in Iraq, issues of tattered walls and insufficient ammunition drop-off points prompted the battalion to begin work as soon as they arrived. Walls that existed prior to the Marine Corps' arrival in country provided inadequate protection against explosives such as mortars. The concrete walls, which dated back to a time when St. 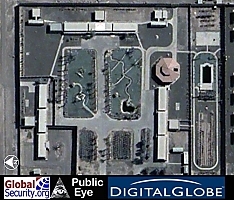 Mere was an Iraqi military base, were missing entire sections. The crumbling maze of walls that remained surrounded various I Marine Expeditionary Force work and living spaces, and acted as little more than an eyesore to the Marines here. The United States is settling in for a long stretch in Iraq. Forward Operating Base [FOB] Mercury is an abandoned Iraqi military base and a former Iranian terrorist training camp, located midway between Baghdad and Fallujah. 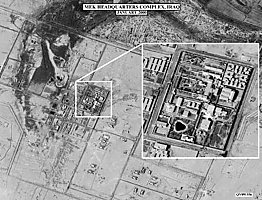 On 09 May 2003 1/B/54 Engineers aided 2/3 ACR in securing and clearing buildings in Mujahedeen-e-Khalq training compound. After clearance is complete, the platoon constructs detention facility for 28 MEK officers, coordinates for quality of life improvements, and begins 10 day guarding mission. TF 1-504 operates out of FOB Mercury (near Fallujah). They are responsible for several towns west of Baghdad, including the external security of the largest prison and detention facility in Iraq. TF 1-504 recently started training Iraqi Facility Protection Service guards. This is a program to train and equip Iraqis so they can begin guarding their own critical facilities, such as police stations, food warehouses, oil storage depots, etc. TF 1-504 has done a great job at removing the Improved Explosive Devices (IED) threat along the road networks east of Fallujah. The enemy has been pushed out of this area or defeated by the Red Devils. The quality of life improvements at FOB Mercury are getting better every day. Every soldier is living in an A/C building and eating at least two hot meals a day. The Red Devils dining facility has a TV with satellite access and DVD capability. Additionally, every soldier has access to satellite TV, showers, and telephone service (10 minutes per week). Within the next 60 days, TF 1-504 will reposition to FOB St Mere. They are building new living quarters for them. The environment at FOB St Mere has more amenities to offer soldiers and will eventually be the base camp for two-thirds of TF Panther. In September 2003 the 82nd Airborne Division's 3rd Brigade Combat Team helped replace the 3rd Infantry Division in Iraq. At the 1st Battalion of the 504th Parachute Infantry Regiment FOB Mercury, workers graded the grounds of the abandoned military camp and spread gravel to suppress the powdery dust. Dozens of new portable toilets dot the compound, along with trash bins and pallets holding water bottles and meals ready to eat. A class of twenty-five Iraqis completed the Facilities Protection Force (FPS) program 11 October 2003 at Forward Operating Base Mercury. The group of students is the first to participate in the three-day course. Upon their graduation, they became an integral part of the Iraq rehabilitation process. Paratroopers from Battery A., 1st Battalion, 319th Airborne Field Artillery Regiment, organized and conducted the training throughout the course. Marines provide for the 24- hour safety and security of forward operating base Camp Mercury, outside of Fallujah. Marines stand guard in the various posts along the perimeter of the base and are responsible for escorting any Iraqi or civilian personnel that come onto the base. In addition to the sentries posted along the camp’s walls, the guard force also keeps a quick reaction force in wait for any possible threats. The QRF, consisting of a squad of Marines with considerable combat power including machine guns, anti-armor rockets and grenade launchers, wait to respond to any emergency that may arise. 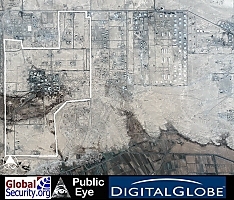 The guard force is responsible for approximately 20 square kilometers of area in and round Camp Mercury. To effectively protect the area, the guard force sends daily patrols around the camp and conducts improvised explosive device searches of the perimeter. 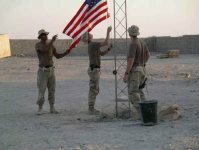 There have been allegations made that between 2003-2004 at Camp Mercury U.S. military personnel engaged in routine and widespread physical punishment towards Iraqi detainees. It is alleged that enlisted men conducted beatings of prisoners prior to questioning, forced strenuous exercises to the point of unconsciousness and exposed detainees to extremes of heat and cold. These alleged methods were employed to produce greater cooperation with interrogators some of whom were apparently members of the CIA. 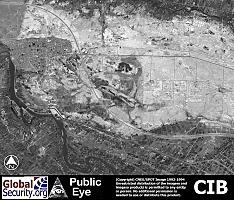 As of September 2005 the U.S. Army was conducting an investigation on what exactly happened at Camp Mercury. Some military personnel also claim that these actions were also used as a form of stress relief from the war. 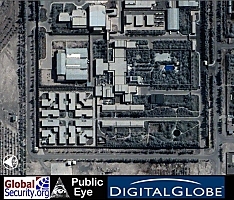 NIMA map of area west of Baghdad, showing MEK training facility. 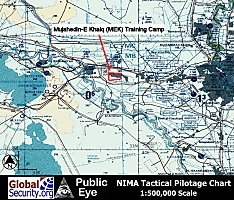 CIB image showing MEK Training Camp to the east of the city of Fallujah.